Zleby Castle is one of the amazing palaces in the territory of the Czech Republic. This castle is an excellent example of a Gothic romantic castle in Eastern Europe, which has a markedly baroque influence in its architecture. Zleby is actually a pleasant village in the central Czech Republic, which is surrounded by the lovely and picturesque scenery. The greatest attraction of the village is till this day Zleby Castle. The area there is known as one of two reserves, where a population of white deer stay. Besides the deer the nature is home to many species of birds and wildlife. 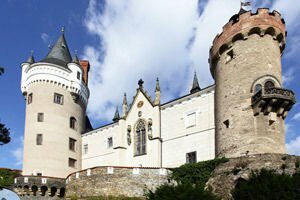 Zleby Castle is located in the small municipality of Čáslav which is located within the beautiful Czech region of Central Bohemia. The gothic palace is considered to be the biggest attraction of the entire Kutna Hora district even though the town is located 25 kilometers from Zleby Castle. The original medieval Gothic structure at this site appears in the 13th century when the castle Zleby was built by the Lords of Lichtenburg. A little later, they abandoned their home and sold it to Charles IV. During the so-called Hussite Wars, Zleby Castle suffered enormous damage and had to be restored and reconstructed in detail. In the 16th and 17th century the mansion was in the possession of Chotouchovských, who made it the amazingly beautiful Renaissance palace we see today. A little later Zleby fell into the hands of Lords of Auersperg. Members of this family pronounced an English style within the castle during the period between 1849 - 1868. The last male heir of the family was Prince Ferdinand, who died in 1942. After his death the castle was managed by Marie Trauttmansdorfu, who took care of the mansion until 1945, when the political system required that it be nationalized. Today's wealth, which has been managed to be preserved within the castle Zleby, is composed of a large and interesting collection of military equipment, interesting leather wallpaper, mosaics, one lineage gallery with portraits of the 16th century and other interesting things. There are organized tours for the visitors to the castle which are in two directions. One leads to the eastern wing, where you can see the kitchens and the other lead to the western part of the Zleby Castle - high tower and its dungeons.